We all know it is it is tricky while comes to shopping for a new mountain bike. The reason is simple as the market is full of different options. A whole lot of possibilities make us confused. To make your life easier we always discuss different mountain bikes in this blog. Today the Diamondback Bicycles Atroz Full Suspension Mountain Bike is the one we will reveal! What do you expect from a mountain bike? Traction, speed, breaking and of course strong construction quality. For sure, the Diamondback Bicycles Atroz meets all the requirements. I personally am using this for a couple of months. So, I know exactly how the bike runs, what the drawbacks are and how much money you need to spend on the model. Let’s check out the honest review of all the pros and cons of the Diamondback. The Diamondback Atroz is designed for trail riding, which is somewhere between mountain biking and cross-country riding. The first thing you’ll probably notice is the wheels these are 27.5 inches which are strong and durable and allow you to ride across a variety of different terrains. Then there’s the 6061 T-6 aluminum frame which comes in three different sizes (small, medium, and large). These entry-level components are of a high quality just what you would expect from a brand like Diamondback. But it’s the design of the bike that’s mighty impressive; compact and contemporary, the bike looks great. It has 120 mm of travel to something you wouldn’t find on most cross-country bikes. The saddle is comfortable to sit on even for long periods, and the gears are easy to control. If you’re interested in the speed this bike can reach, listen to this: The Diamondback Atroz Full Suspension Mountain Bike has a total of nine different speeds, made possible by there being only chainring and no front derailleur. The max gear ratio of the bike is 32111, which gives it a maximum gearing of 80 gear inches definitely one of the best features of this bike. What does this mean? Well, this essentially allows you to travel at fast speeds when on flat ground. Combined with the 27.5-inch wheels, this bike is great for picking up speed and getting to your destination in a quicker time frame. We need to point out that the bike has a minimum gear ratio of 32/24 too, or 26 gear inches, which will make it easier to climb up an ascent or slope. Sounds pretty impressive, right? This minimum gearing is quite high when compared with other bikes on the market. Rear Shock: The rear shock of the bike is the fascinating feature of the Diamondback Atroz. Because of the extreme rear shock, it is popularly known as a comfort bike. The rear shock will provide you amazing control while riding as well. Lightweight: Because the bike has an aluminum frame, it’s lighter than other materials allowing you to glide at a good speed without feeling like you are being weighed down. Affordable: For such quality, we can say the price is affordable bike enough. You will not go to get something like this in such price range, that’s for sure. Construction: The Diamondback is heavily constructed for climb slopes and enjoy riding in the countryside on those beautiful yellowish afternoons. The frame is stiff and sturdy. It will allow you to ride on the rockier ground without breaking a sweat. Customer Service: Diamondback is renowned for their customer service, and there are many ways you can get in touch with a member of staff if you have a query about the bike or want to find out more information about the product. When you purchase the bike, everything you need to get started is included so you can start riding straight away. Entry Level Bike: The components you’ll find on the Diamondback Atroz are what’s known as entry-level; basically, they will introduce you to the world of mountain bikes, but they are unlikely to withstand years of heavy use. 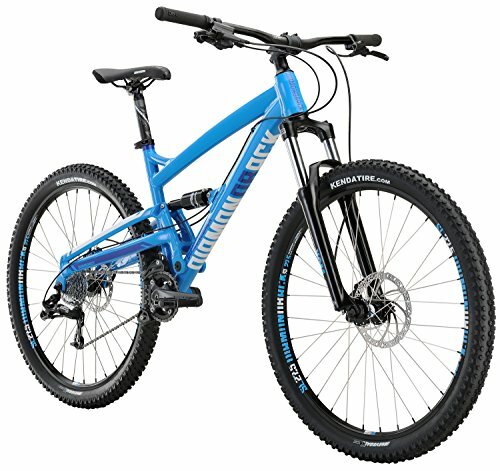 However, the wheels and frame are of excellent quality making this perfect beginner mountain bike. Finding Parts: Another thing to note is that replacement parts for the 27.5-inch wheels are difficult to source as this wheel size has only recently been launched; however, this should change in the future. The Diamondback Bicycle Atroz is a compact, contemporary trail bike that packs an almighty punch. Packed full of features, the bike can travel fast speeds on flat terrain and climb slopes with ease. That’s mainly down to the simple, aluminum frame which is lightweight without compromising on durability. But that’s not all with its 27-inch wheels and 120 mm of travel; the bike is one of the best in its price range perfect for beginners and more experienced cyclists alike. Pick it before the stock turns out, or you will surely regret.